Using a tankless water heater saves you money, space, time and is ecofriendly. With a tankless water heater, prioritizing activities that use hot water is a thing of the past. Tankless water heaters only operate when hot water is needed, eliminating the need for a tank to store hot water. Cold water enters the tankless water heater and is heated as it passes through. It will adjust the amount of gas and the size of the flame used to heat the water depending on the demand of water and heat. Every step is efficient, saving energy when possible. Tankless water heaters only need enough power to heat the amount of water that you are going to use, saving you money on your energy bill. Rinnai tankless water heaters meet all of the Energy Star qualifications. They also use up to forty percent less energy than a traditional tank. This helps to conserve natural resources. Tankless water heaters lower CO2 emissions, which leads to a cleaner air and a better environment. Tankless water heaters increase your home’s value by using energy efficiency and modern technology to improve your Home Energy Rating System (HERS) index score. There are also many energy efficiency rebates and tax credits available. Multiple sizes are available and you can also customize your efficiency. 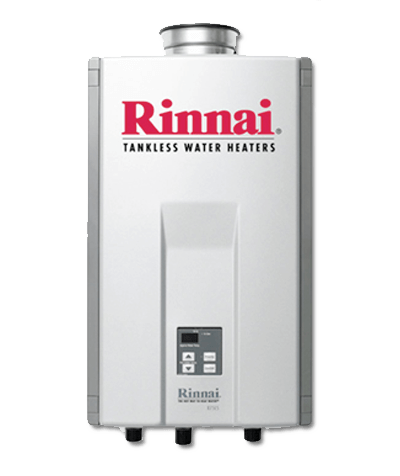 The size of a Rinnai tankless water heaters is about the size of a small suitcase. It can be installed on any wall or it conveniently fits in small spaces. Every part of your tankless water heater can be fixed or replaced separately, preventing you from having to replace the entire unit. Contact us about having a tankless water heater installed!